Sticky Rice or Xoi is a staple ingredient in Vietnamese cuisine. What can I say, we are carb-lovers with our abundant variety of rice, noodles and doughs. The glutinous, slightly chewy texture of the sticky rice is pure comfort food. And since sticky rice is mild in flavor, it goes well with just about everything! 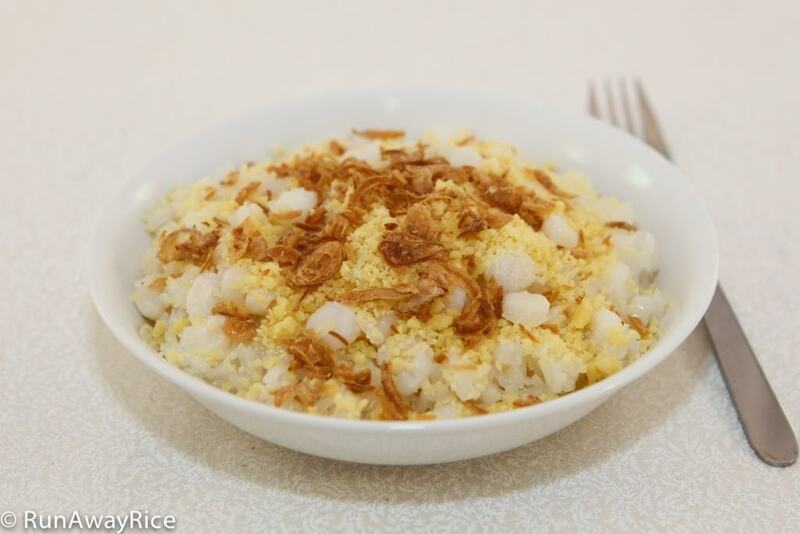 This recipe pairs sticky rice with hominy and then tops it off with mung bean and fried onions to create a unique dish with delicious tastes and textures. What exactly is hominy you ask? Hominy is made from kernels of corn which are soaked in a lye or lime solution. The soaking causes the kernels to puff up into little balls. Hominy is not sweet like fresh corn and but actually rather mild. In terms of texture, it’s dense and mealy like a bean. It is very similar in texture to chick peas or garbanzo beans. As hominy is typically canned in the same soaking solution, I always rinse the hominy several times with cold tap water before using it in any recipe. I love having this dish for breakfast and will often make a batch at the beginning of the week. Then I prepare individual portions of the rice and mung bean and store in the refrigerator. In the morning, I just pop it into the the microwave for a minute, sprinkle a bit of the fried onions and have a hot breakfast to enjoy! Wash the sticky rice with water several times until the water is clear. Soak the rice in water for 2 hours. Pour contents of hominy into a large colander and rinse with water 3 times. Put the hominy into a large glass bowl. Add 1/2 cup of water. Cover with plastic wrap and microwave on High for 5 minutes. Drain rice in a colander and shake off the excess water. Add cooked hominy to rice and combine together. Again, shake the colander removing as much of the excess water as possible. Be sure to spend a few minutes on this process. If you don’t drain off the excess water, the rice will be too wet once it’s cooked. Add the rice and hominy into the rice cooker. Add salt and combine. Add the water. Smooth out the rice and hominy using a spoon or spatula. Snap rice cooker lid close and set to Cook. When the rice cooker switches over to the Keep Warm setting (approximately 20 minutes), open the lid and stir everything together. Close the lid and let rice and hominy cook for another 20-25 minutes. I use the rice cooker when making smaller portions of xoi (2-4 servings) and don’t have a lot of time. When I make larger servings for Tet, parties, etc., I use a steamer. The traditional steamer method definitely makes a better xoi because the rice isn’t so moist as when made in the rice cooker. I think the trick to steaming xoi so it’s deo (chewy) is to add water throughout the steam processing. I use a spray bottle and spritz the rice with water multiple times while steaming. So we’re adding the moisture gradually as the rice is expanding. When cooking with a rice cooker, I try to soak the rice for at least 1-2 hours. The soaking helps to enhance the chewy texture. Hope that helps! Love your recipe and is simple too especially steaming sweet rice in rice cooker so much easier. Need to know if the 21/2 cup water is for the 21/2 cup sweet rice that you use to cook in the rice cooker. Yes the 2 1/2 cups water is for cooking the sweet rice. General rule of thumb is to use equal amounts of rice and water. Good Luck and feel free to share your results! Never mind Trang. I think 2 1/2 cups of stick rice is right because otherwise the amount of water is too much. Lol! Take all the credit, you did all of the hard work and I am sure your family appreciated your efforts. If you are a xoi lover, you will love Xoi Bap as well. Anyway, just want to clarify as the recipe calls for 2 1/2 cups of sweet rice but the video posted 2-1/2 cups (=1 cup). My apologies on the measurement typo in the video. It’s 2 and 1/2 cups for the sticky rice as in this recipe. No problem. Thank You! You are so kind.